The Berlin Wall is back – in Augmented Reality! Experience german history at an historical place, right in the middle of germanys capital. 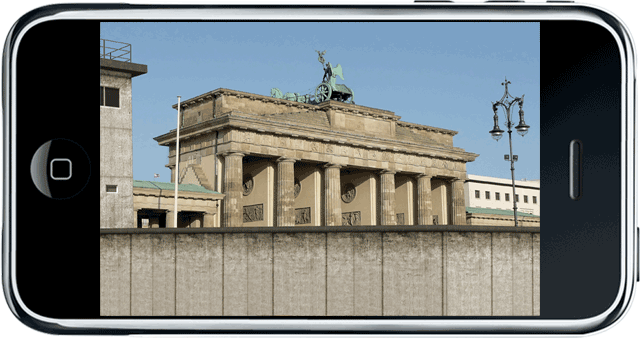 Use your handset to follow the wall at the former border line at Brandenburg gate, the Reichstag and Potsdamer Platz and experience the Berlin Wall in it‘s original size. Do you have an idea how it feels to have this huge concrete barrier right next to you? Go and find out. It‘s incredible! The Berlin Wall was a concrete barrier built by the German Democratic Republic that completely enclosed the city of West Berlin, separating it from East Germany including East Berlin. The wall fell in 1989, but is now back in it’s original environmental context in Berlin with the Berlin Wall 3D for Layar. The Berlin Wall 3D puts history into its location context and encourages the interaction with that specific historic site. 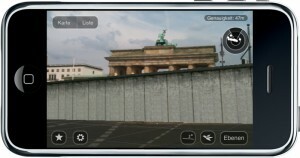 Just point your handset to Brandenburg gate and see how the fallen Berlin Wall comes back to life. The exclusively designed 3D Berlin Wall even includes several watch towers that were located on the eastern side of the wall in order to observe the former border strip. 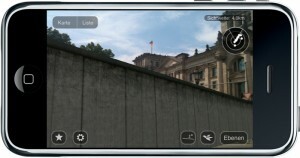 The Berlin Wall 3D is a new milestone in Mobile Augmented Reality and an extraordinary 3D experience. We created the Berlin Wall 3D in close cooperation with our partner Superimpose. The Berlin Wall 3D layer runs on Hoppala layer server technology. German public TV station RBB showed a 3 min. clip about Berlin Wall 3D in the Abendschau news on July, 18th, 2010. Visit the Hoppala Berlin Wall 3D gallery on Flickr. This entry was posted in Highlights, Projects, Videos. Bookmark the permalink.